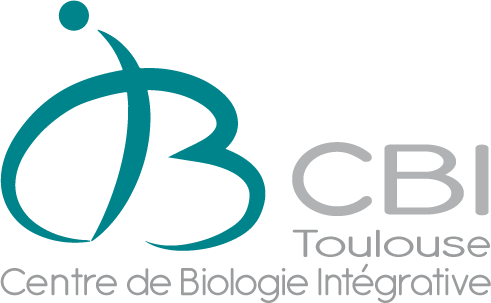 Bourse de thèse de 3 ans disponsible dans le labo. Merci de contacter Dr Legube avant le 24 avril. 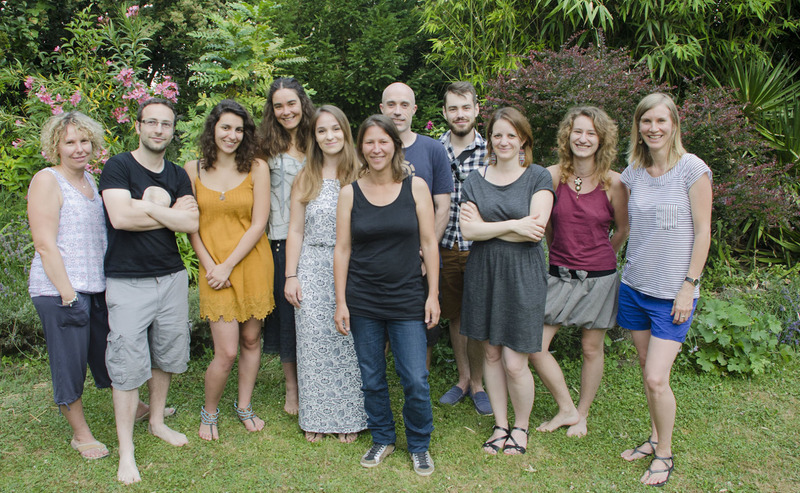 Venez découvrir une nouvelle manière d'intégrer CRISPR/Cas9 dans les cellules, un travail mené par le Dr Ricci au LBMC à Lyon auquel nous avons contribué: Les nanoblades: des nevettes pour opérer le génome. 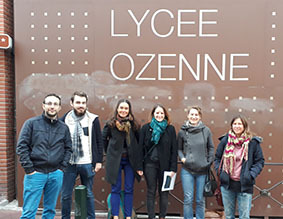 Participation of the team to DECLICS at Lycéee Ozenne in the center of Toulouse: Meetings between High school students and researchers. 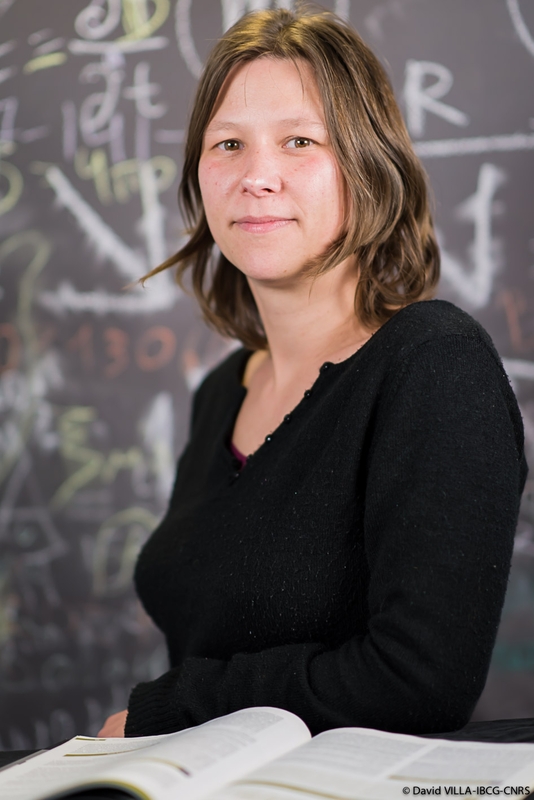 Thomas Clouaire's paper on "Comprehensive Mapping of Histone Modifications at DNA Double-Strand Breaks Deciphers Repair Pathway Chromatin Signatures" is out in Molecular Cell, advanced articles. Over the past few years it has become evident that chromatin, that packages DNA in eukaryotes nuclei and that is encoding epigenetic information, is the real substrate for all DNA related processes and plays a decisive role in DNA repair. Repair into this chromatin context raises several questions that we aim to address in the lab. Among the types of damage that can challenge the DNA molecule, DNA Double Strands Breaks (DSBs) are the most deleterious since they can lead to various mutations and chromosomes rearrangements. This type of damage can arise during development as part of programmed processes (during immune system formation for example) but also due to various environmental stress (cigarette smoke, irradiation,..). Over the past few years it has become evident that chromatin, that packages DNA in eukaryotes nuclei and that is encoding epigenetic information, is the real substrate for all DNA related processes and plays a decisive role in DNA repair. Repair of DSB into the chromatin context raises several questions that we aim to address in the lab. 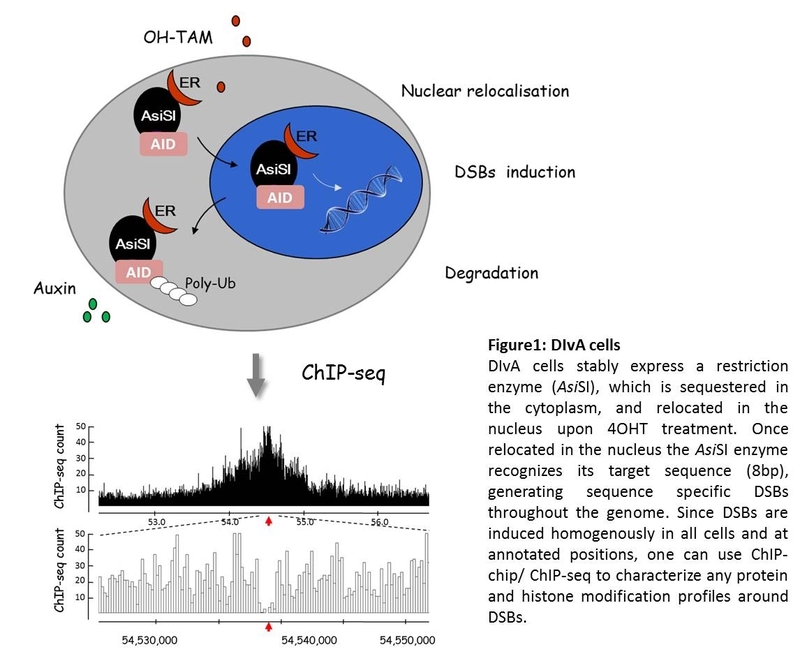 Using an experimental system we recently developed (called DIvA for DSB Inducible via AsiSI), that allows the induction of multiple sequence-specific DSBs widespread across the genome, we investigate several uncovered aspects of the relationship between chromatin and DSB repair. What are the chromatin changes induced at damaged loci to facilitate repair? Many DSB-induced chromatin modifications have been identified in the past few years, including histones (de)acetylation, ubiquitylation, phosphorylation, and methylation. These DSBs-induced modifications clearly contribute to adequate and efficient repair. 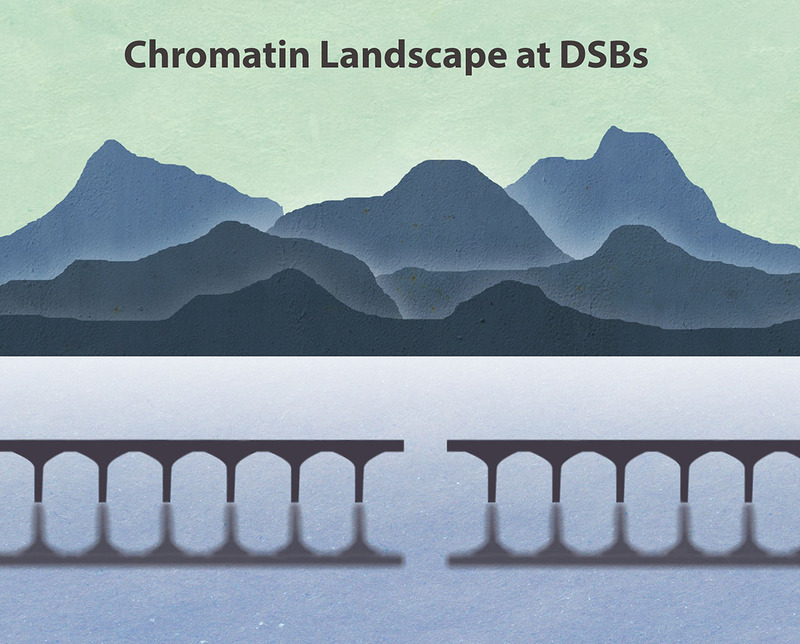 However, a complete and detailed picture of the chromatin landscape set up at DSB is still awaited. More specifically the set of histone modifications associated with each repair pathway ("repair histone code") is still mostly unknown. In order to characterize this chromatin landscape at a high resolution, we developed, a few years ago an experimental system (DIvA for DSB Inducible via AsiSI) based on the expression of a restriction enzyme fused to a modified estrogen receptor ligand binding domain and to an auxin-inducible degron (AID-AsiSI-ER). 4OHT treatment of this cell line triggers the nuclear localization of the AsiSI restriction enzyme and the rapid induction (<1 hour) of multiples (about 150) sequence-specific DSBs, widespread across the genome (Iacovoni et al, 2010; Massip et al, 2010). An additional auxin treatment leads to the rapid degradation of the enzyme thus allowing repair completion (Aymard et al, 2014). In other words this system allows a “pulse-chase” induction of DSB at annotated sites, dispersed on the human genome. 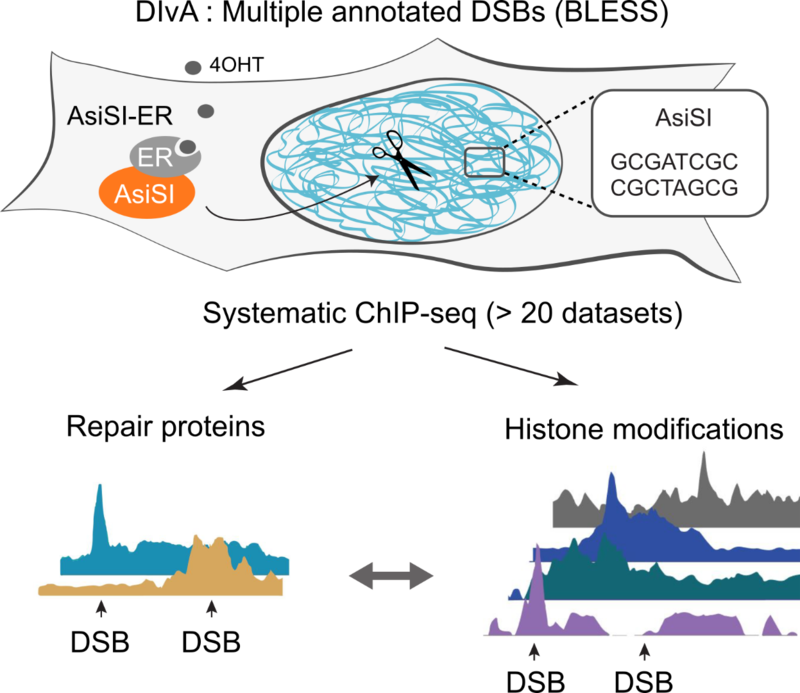 Since AsiSI induces unambiguously positioned DSBs, we can use ChIP-chip/seq to draw high resolution profiles of DSB-induced chromatin modifications and DNA repair complexes around breaks, in order to decipher the chromatin landscape induced at DSBs (Iacovoni et al, 2010; Massip et al, 2010; Caron et al, 2012). How does the chromatin state that exists prior the break influence the recognition of DSB and the repair pathway choice? DSBs are repaired by two main groups of pathways, namely Non Homologous End Joining (NHEJ) and Homologous Recombination (HR) that are both essential for survival. When inaccurate, these pathways don’t lead to the same consequence on the genome (for example Alt-NHEJ is the main cause of translocations while unequal HR can provoke repeat amplification). The choice between all these pathways is thus a critical aspect of DSB repair. However, how this choice is executed is far from being understood. A fair amount of studies, including ours, suggest a role of chromatin in addressing the repair pathway. Importantly, several proteins involved in DSB repair possess modules known to “read and translate” the histone code (such as the Tudor domain of 53BP1). We can thus envisage that some histone marks present before the appearance of a DSB, could specifically help to recruit and/or stabilize one or the other repair pathway (Clouaire, et al, 2015). Along this line we recently found that DSB induced in active genes are channeled to repair by HR, in a manner that depends on H3K36me3, a histone mark associated with transcription elongation (Aymard et al, 2014). We are following up these investigations, trying to understand how chromatin influences DSB repair choice, using different model systems. How is this DSB-induced chromatin landscape removed to recover the original epigenetic modifications. 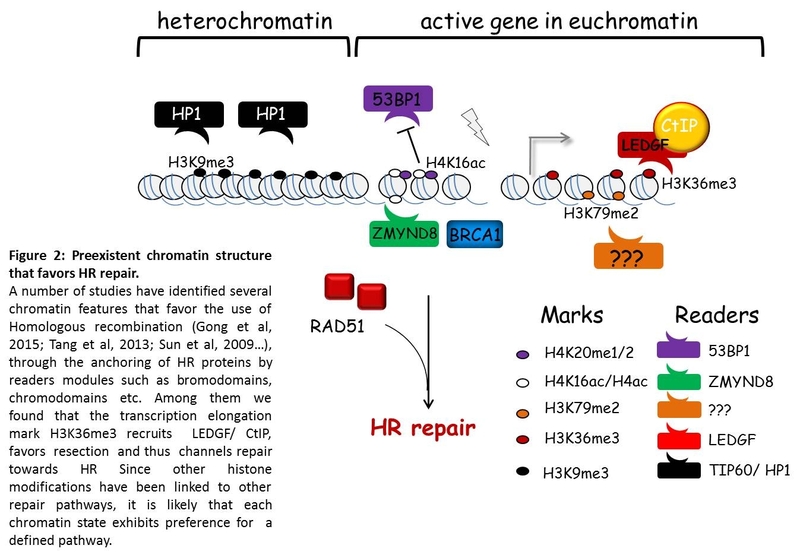 Once repair has been completed, chromatin should be properly reassembled to maintain epigenome stability. Few studies were conducted to understand how gH2AX is removed from the megabase domain where it accumulates following DSB induction. However, beyond gH2AX, DSB repair is associated with a complex chromatin remodeling (see above), that also includes extensive nucleosome mobilization/eviction and the local inactivation of transcription when the damage occurs in a gene The mechanisms that allow proper reassembly of evicted nucleosomes, erasure of the DSB-induced chromatin landscape and transcriptional restart following DSB repair have only been poorly explored yet. Using the DIvA cell line, we investigate the mechanism at work to recover the initial chromatin state and maintain cell fate.